Active and hardy shoaling fish barbs make a great addition to any aquarium with suitably sized inhabitants, and they're an excellent choice for beginners. Though they prefer slightly acidic water they are capable of adapting to a variety of conditions and are easy to feed and look after. Energetic as they are, barbs can be intolerant of more placid tankmates, but this is basically a frustrated expression of their desire to play and will usually stop if they have enough others of their own species to interact with. For this reason, you should always keep them in groups of six or more. Most barbs are quite small but they'll need plenty of room in the aquarium to swim about. They enjoy having plants to chase around and the quieter species appreciate hiding places. Adding bogwood to your aquarium is often a good way of keeping barbs happy as well as maintaining the right water conditions. Barbs are omnivorous and do best on a varied diet. They will accept flakes but should be given live food like daphnia, shrimp and bloodworm every week or two. They also enjoy spirulina algae discs. Rosy Barbs -These medium sized red and gold fish are happiest in shoals, with two females to each male. They are more likely to be aggressive if kept in smaller numbers. Tiger Barbs -These handsome stripy silver fish are also available in a green variety. They're highly active and like to play within their shoals. Panda Barbs -Also known as striped barbs, these attractive black and silver fish are shy and peaceful by nature. They need to be with others of their own kind but also interact amicably with other fish. 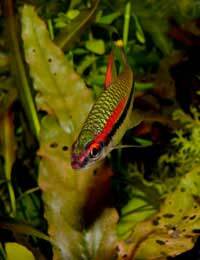 Cherry Barbs -These slender little fish get their name because of the colour assumed by males during spawning. They tend to be shy. 'Albino' varieties with golden colouration are also available. Denison Barbs -Sometimes mistakenly called sharks, these bright, angular fish are peaceful and get on well in community tanks. Give them plenty of vegetables and beware of their fondness for jumping. Two Spot Barbs -Among the smallest barb species, these delightful little fish are happiest in a large shoal with two females to every one male. Most species of barb, including those listed above, are fairy easy to breed in captivity. To do it successfully you'll need to set up a separate spawning tank for one male and one or two females (depending on the species and the way your fish bond - watch them closely beforehand to determine their preferences). In all species of barb the males are smaller and slimmer than the females. Make sure your spawning tank has very clean water (with no build-up of ammonia) and is full of fine-leafed plants. When spawning occurs, the eggs will stick to these. You should remove the parents from the tank immediately afterwards so that they don't eat the eggs. Despite the small size of the adults, most barb fry are born large enough to eat small brine shrimp from the start. Alternatively, they can be fed on powdered flake food or with a special fry food. Barb fry are often numerous and grow fast, so make sure you've got plenty of space for them. Barbs may be seen as a beginner's fish, but don't let that fool you into thinking they're nothing to get excited about. Alert and vigorous, they're always interesting to watch, and they have a variety of fascinating group behaviours. They're generally assertive enough to look after themselves without being too aggressive for your other fish, and their small size means they're easy to keep in the sort of shoals they prefer. Give them a try and you'll find they're lots of fun.